This blend of herbs, vitamins and minerals has been designed with a woman’s needs in mind. It’s high in iron, which contributes to normal cognitive function, and it’s also high in essential folic acid. 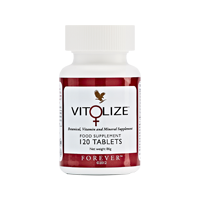 As well as calcium, vitamin D and B12, Vitolize (for women) also contains vitamin B6, which contributes to the regulation of hormonal activity. Take 2 tablets twice daily as a food supplement. Bulking agent (microcrystalline cellulose), magnesium bisglycinate, cranberry powder (vaccinium macrocarpon), calcium carbonate, thickener (hydroxypropyl methylcellulose), anti-caking agent (stearic acid), ascorbic acid, bulking agent (croscarmellose sodium), vitamin E (d-alpha-tocopheryl acetate, modified corn starch, silicon dioxide), thickener (croscarmellose sodium, sodium carboxymethylcellulose), anti-caking agent (silicon dioxide), d-alpha-tocopheryl acetate, dextrin, dextrose, medium chain triglycerides, acidity regulator (trisodium citrate), apple powder (malus domestica), passionflower powder (passiflora incarnata), schizandra berry powder (schisandra chinensis), ferrous bisglycinate, emulsifier (magnesium stearate), vitamin D3 (cholecalciferol, modified corn starch, sucrose), pyridoxine hydrochloride, vitamin B12 (cyanocobalamin, dicalcium phosphate), folic acid.